It’s February and even though I am longing for warmer days, that doesn’t mean I’m getting them… far from it actually! 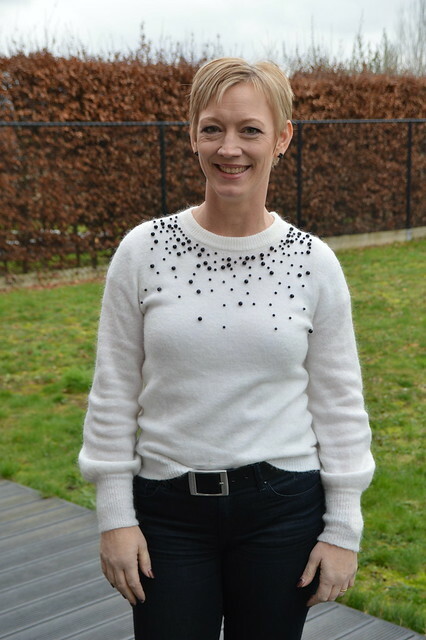 So I’m still glad that I have bought some winter sweaters a couple of months ago, one of which I will show in today’s fashionpost. I bought this winter white wool sweater at H&M recently and I have worn it on and off to be honest. It’s warm, it’s stylish and elegant and I can wear it to several occasions. I have washed it many times (because well… white you know!!) and I think the wool is of good quality even though this sweater only cost me about 30 EUR. No necklace needed with this sweater as it’s covered in ‘black pearls’, which makes the sweater even a bit festive don’t you think? I am wearing my white sweater with very dark bootleg jeans from Esprit. I have left the legs of this jeans as long as possible, which makes my legs look a bit longer. This is a comfortable outfit and I have worn it a lot this winter. What have you been wearing on and off these past couple of months? This entry was posted in Fashion, Outfits, Winter and tagged Fashion, H&M, outfit, sweater.